This never-used lightweight tote is made from recycled materials and is to be reused. 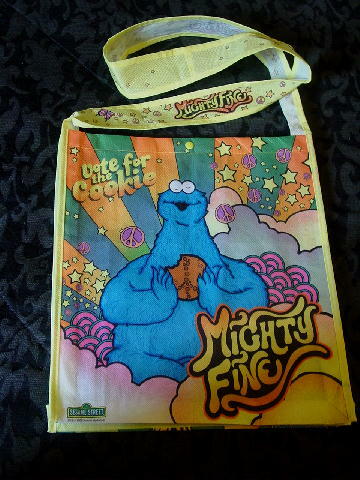 On the front is a blue Cookie Monster, stars, stripes, and other designs with Mighty Fine on the lower right side. The Sesame Street sign, TM, etc. are near the bottom of the left front side. 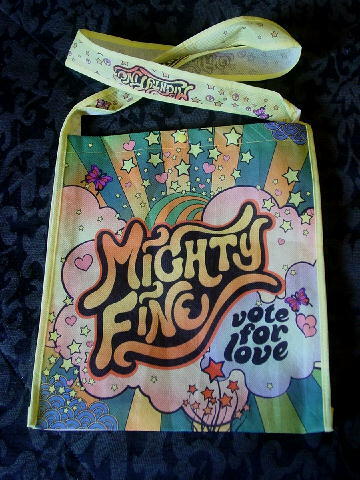 On the back is vote for love in black, stars, hearts, butterflies, etc. WWD MAGIC, and designs are on the 2 1/8" wide sides. It has a 40" by 2 1/8" long shoulder strap with a 19" long drop.